Note: In addition to the occupational terms contained in this section see also those marked with an asterisk in code 054.
shovels crushed gold hearing quartz evenly over mercury lying in shallow east iron pan, contents of which are agitated mechanically; removes quartz residues which are swept to the sides of the pan by rotating arms; removes amalgam when sufficiently high in gold content, to be filtered and distilled. a surface labourer q.v. who wheels ashes from boilers to ash tip, or loads ashes into wagons. denotes a girl employed on tin dressing floor, as a dressing floors labourer q.v. bank labourer. removes ore or waste from top of shaft; takes wagons out of cage, and puts on empty ones; or, where no cage is used, hooks "kibbles" on to winding rope or takes them off; signals to winding engineman. cleans, and keeps in running order, belt on which ore travels, to enable pickers to remove refuse therefrom. breaks up ore, ready for jiggers q.v., with a buck, i.e., a broadheaded hammer. operates and keeps clean buddle, usually a series of plane or inclined troughs, in which ore, after it has been crushed and finely ground, is refined or concentrated by allowing running water to wash out lighter and less valuable portions. wheels concentrated ore out of "buddle" (see buddle attendant) in wheelbarrow. attends to burning house in which tin ore is calcined. see banksman ; cf. onsetter (054). keeps in order house or dressing room where miners change their clothes; attends to fire and dries the clothes. checks, on behalf of miners, weight of ore got, and deductions therefrom at weighbridge; is employed and paid by the workmen. breaks ore into small pieces with small hammer, and sorts it according to value. breaks up copper ore with mallet 'into small pieces. separates different grades of copper ore by hand as crushed ore passes on a travelling "picking" belt. an errand boy in counting house or office. cleans counting house, or office, cooks meals for officials, and washes clothes. throws or shovels lumps of ore into crushing mills; controls mills by levers and cleans and oils hearings when necessary; for first or coarse crushing, heavy rock-breakers are used, followed by other breakers, with jaws set to crush somewhat finer; for next stage rolls of many types are used, and for still finer crushings, ball and tube mills. general term for unskilled workers employed at time rates of wages; cf. dataller (054). term sometimes used in tin mines for owner's account man (054) q.v. does any unskilled work with pick and shovel. dresses, either by hand or by machine, ore sent out from mine, rejecting waste material and selecting that which is valuable; if two or more valuable minerals are both present in same deposits, separates them; first process is generally sorting, by hand; ore is then dealt with by jigs, vanners, revolving tables, etc. 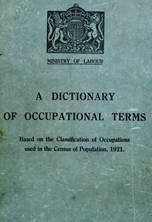 general term for all workers in lead dressing shed, including buddler, jigger, slimeman, tableman, vanner q.v. (ii) tin mines, see dressing floors labourer. superintends dressing floors, or places where ore is washed and "dressed" to remove impurities. general terms for workers on dressing floor, engaged in crashing, spalling, or dressing tin or tin ore.
is in charge of machine for excavating material from quarry face. regulates supply of tin ore and water to frames or "buddles." collects and sorts picks, drills, etc., for sharpening. general term for surface workers of mine. general term for men working on inferior copper ore.
removes overburden (topsoil) from ironstone in quarry. (ii) as for metal picker (054). trims or cleans waste dirt, etc., from ironstone lumps with pick and hammer. controls by levers and generally attends to jig, i.e., water concentration machine used to separate larger portions of ore from rock, stones, etc., with which it is found; watches apparatus for efficient working; oils working parts and keeps them clean. (Yorkshire term ); cleans shale from ironstone with a knapper, a small hammer and pick combined. attends to safety lamps used underground, and is responsible for cleaning them, etc. fits up, maintains and repairs machinery used for obtaining tin ore from alluvial soil in beds of stream. feeds crushed ore to hoppers of separating machine; controls machine and removes magnetic ore and waste, as separated, when necessary. works in ore dressing mills or plants; sees that ore is properly crushed, and then distributed to jigs, tables, buddies, or other machines. (ii) see count house keeper. as for picker, metal (054). (ii) (iron mines), see packer, kieve. general terms for day worker working in owner's interest as distinct from contractor's, and paid direct by owner. weighs full tube, trams, or bogies sent out by miners, weight of each tub being credited to miner who has sent it out. fills with shovel and attends to kieve or keeve. i.e., a washing tub in which crushed ore is stirred in water by mechanical means and allowed to settle. picks over ore as it passes over screen or table on travelling picking belt to remove stone, dirt or other impurities. gets mineral from quarry as distinguished from mine; otherwise similar to miner (054) q.v. raceman; keeps water-race in repair, i.e., channel conveying water to water wheel or turbine. general term for getter and other workers in mine producing ores containing radium. pulverises average sample of ore with flat-headed hammer, ready for sampler q.v. selects average samples of ore, from which assay or analysis may be made, to determine character and value of material. passes crushed iron-stone over screens or sieves, either fixed or movable, to extract iron ore dust. general term for worker dealing with "slimes," i.e., finely crushed lead ore mixed with water in dressing operations, including tableman, trunker, vanner, and (in Scotland) buddler q.v. removes topsoil or rubble from above ore.
picks out higher grade lumps of ore as they travel past on endless belt. sorts or picks out copper ore mingled with tin ore sent to surface. sorts out from pitchblende ore lumps containing pitchblende in sufficient quantity to warrant further treatment, for extraction of uranium and radium compounds. breaks ore into small pieces, with mallet. crushes ore with heavy "stamps," or pestles raised by water or steam, or worked by gravity; watches efficient working of apparatus, supervises stamp labourers, and signals to stamping engine driver q.v. attends to chutes through which ore is run into stamps; regulates rate at which ore is so run. takas from washing stream (natural), at convenient settling points, tin ore which has settled to bottom of water. impounds mineral washed down stream from waste of mills attached to wolfram mines, and recovers additional wolfram therefrom; for more usual practice, see magnetic separator. general term for man or boy employed at surface of mine. an unskilled workman at surface of mine or quarry, engaged in wheeling ashes, discharging timber, grease, oil, etc. shovels powdered lead ore mixed with sand on to "Wiffley" concentrating table and controls it whilst in operation; removes concentrated ores and depleted sand. does unskilled work in or about tin stream. removes heavy alluvial deposits and generally attends to tin stream. operates lever which tips tubs to empty them of mineral, stone, shale, etc., on bank or tips; sometimes specifically designated according to contents of tubs, e.g., stone tipper, sulphur tipper. takes tokens off tubs when sent up to surface filled; (tokens are pieces of metal or leather stamped with miner's or putter's number or mark, and filling or putting). tosses or shakes pulverized tin ore into water in "kieve," or vat; tin ore, being heavy, sinks to bottom, while refuse rises to top. trims ore on railway wagons to prevent loss in transport. loads wagons with ore at surface. separates slimes from ore by running mixture into and out of a long box, launder or trunk. cleans tubs, trams, or bogies in which stone or ore is transported. feeds and tends machinery of manner machine, used for concentration of metal ores, i.e., for sifting out portions of heavier metal bearing ore from lighter rock after it has been crushed; sometimes specifically designated according to type of machine used, e.g. frue vanner. couples wagons together at surface of iron mine; usually also uncouples wagons and assists shunter (704) q.v. fills wagons with ore, etc., in quarry. loads wagons with ore, shale, etc., at pit head. general terms for any worker who attends to machinery for washing ore, e.g., lead ore to remove impurities, including jigger and buddler q.v. as for water leader (054). weighs ore as it passes over weighbridge; sometimes also keeps record of wagons sent out and labels them to destination. weighs ore at surface of mine or quarry. (ii) weighs and despatches loaded railway wagons. drives "whim," a horse-driven capstan for raising ore or water from mine. prepares, on surface, timber used for support of roof and sides of workings, and sends it into mine.